Blanca Flores, left, along with husband Eloy Flores have brought Fresh & Delicious to 158 W Grand Ave.
Fresh & Delicious Coffee-Salad -Juice Bar started with a soft opening, yet made healthy food news at 158 W Grand Ave. by Maple Street Plaza this week. The Escondido husband-and-wife team of Eloy and Blanca Flores spent 18 months lining up the proper permits to bring an eclectically healthy menu of tortas, sandwiches and wraps; blends, smoothies, homemade salads and Acai bowls to downtown. Prices are right with sandwiches, tortas and wraps listed at $5.99, salads at $6.49 and 20-ounce blends and smoothies at $5 to $5.50. Specialties include Tostilocos, Diablitos, Raspados and Auguas Frescas with milk shales, or Licuados available in strawberry, banana, papaya, cantaloupe and chocomilk flavors. For more info, call (760) 975-3311. Kitchens For Good workers prepare healthy feasts for the people. Kitchens for Good, a new San Diego-based nonprofit organization, has signed on with the city of San Marcos to serve locally sourced, made-from-scratch gourmet meals at the city’s senior center. The company offers soup and salad or hot entree options. The City Council signed off on a $70,000 one-year contract to hire Kitchens for Good to provide the roughly 50 meals served each weekday to people at the San Marcos Senior Activity Center’s Discovery Cafe. The cafe also serves about 150 meals during holiday celebrations and other special events. 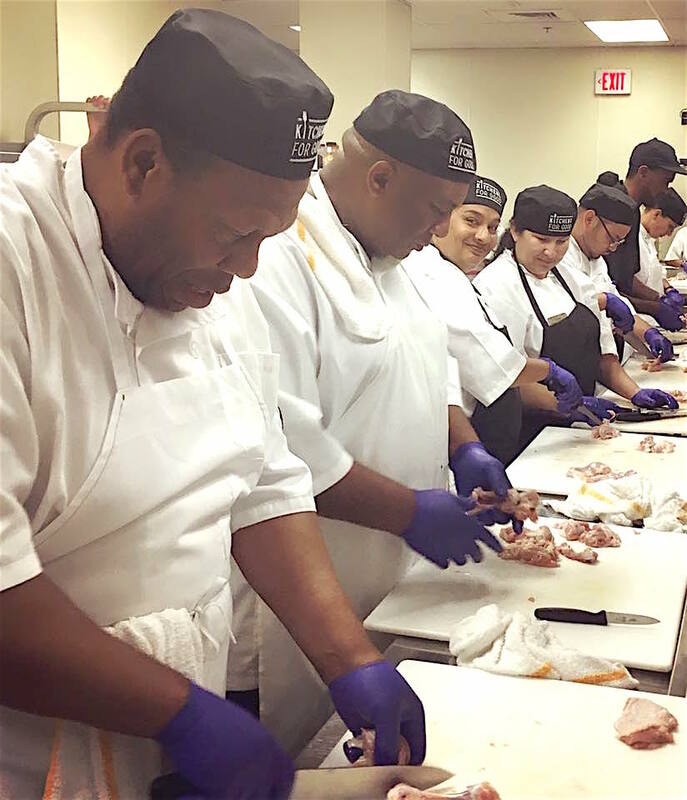 Kitchens for Good provides locally sourced meals to vulnerable populations in need, while also teaching culinary skills to people such as former inmates or youth who have aged out of foster care. The group makes everything from scratch every day — no canned fruits or vegetables, according to Aviva Paley, Kitchens for Good director of programs. “We really want to improve the health of the senior population, and to do that, you have got to make food taste really good,” Paley said. The group’s kitchen at Chollas View in San Diego opened last fall. Food is prepared there and driven to San Marcos. The group is looking open a kitchen in North County, Paley said. For more information, visit http://kitchensforgood.org. Chronic Tacos, the California inspired Mexican grill, is set to open five new locations in California this year. The new locations include Barstow, Palmdale, Tustin, San Marcos, and Oceanside. With 24 preexisting California locations, the new restaurants provide even more convenient access across the state. The new opening locations’ dates and locations include: Palmdale, California, now open; Tustin, California, to open in June; San Marcos, California, to open in June; Barstow, California, to open in August; Oceanside, California, to open by year’s end. Chronic Tacos continues to use third generation recipes to create authentic Mexican food, differentiating Chronic Tacos from other chains. Fresh ingredients and high-quality cuisine are staples of the Chronic Tacos menu. For more information, visit https://www.eatchronictacos.com. What’s in your gas station? BBQ? Be the first to comment on "Healthy food choices come to town"